Since a decade, 3D bioprinting has influenced the patient care i.e. advent of anatomical models to new patient-matched devices. Moreover, 3D manufacturing in clinical setups has mounted due to the technically advanced infrastructure (machines, materials, software). 3D bioprinting or anatomic modeling labs fabricate models for complex surgical care, multidisciplinary care of complex patients, presurgical simulations of patient specific vascular and non-vascular procedures, custom device creation, and medical and patient education. Goldstein Research analyst forecast the 3D Bioprinters Market size is set to reach USD 1.24 billion by 2024, at a CAGR of 24% over the forecast years. The report covers the present ground scenario and the future growth prospects of the 3D Bioprinters Market for 2016-2024 along with the ongoing research and development tasks, investments in the various fields of healthcare sector and opportunistic markets of 3D Bioprinters based on the healthcare policies worldwide. We calculated the market size and revenue share on the basis of revenue generated from major players across the globe. On the basis of material, living cells, hydrogels, and extracellular matrices hold the supremacy in the global 3D Bioprinters market share i.e. 65% altogether. Furthermore, in terms of application regenerative medicine is anticipated to rake in a whole lot of demand in the market to grab a larger share in the coming years due to growing need for organs and tissues that are suitable for transplantation. 3D Bioprinter Market Outlook 2016-2024, has been prepared based on an in-depth market analysis from industry experts. 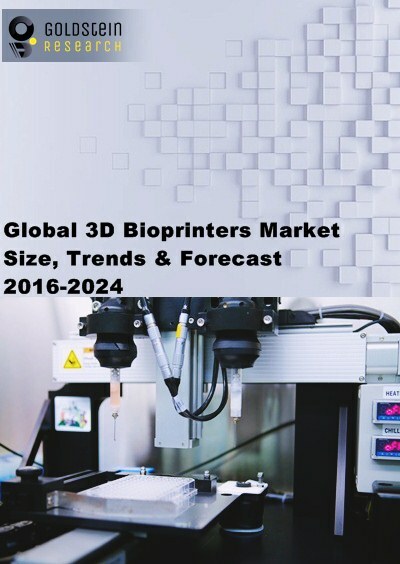 The report covers the competitive landscape and current position of major players in the global 3D Bioprinter market. The report also includes porter’s five force model, SWOT analysis, company profiling, business strategies of market players and their business models. Global 3D Bioprinter market report also recognizes value chain analysis to understand the cost differentiation to provide competitive advantage to the existing and new entry players. Our global 3D Bioprinter Market report comprises of the following companies as the key players in the 3D Bioprinter Market: Aspect Biosystems Ltd., Nano 3D Biosciences, Inc., Gesim, Envisiontec GmbH, Regenovo Biotechnology Co., Ltd., Organovo Holdings, Inc., Poietis, Regenhu Ltd., 3Dynamic Systems Ltd., Biobots, Cyfuse Biomedical K.K., Cellink, 3D Bioprinting Solutions, Digilab, InSphero. Other high-flying vendors in the market are: Luxexcel Group BV, TeVido BioDevices, Voxeljet, Stratasys Ltd., Solidscape, Materialise NV, Bio3D Technologies. According to the report, major driving factor for 3D Bioprinter Market is its implication in the future of transplants with no organ donor waiting list. Many players are contributing to ease of availability of organs like, a Philadelphia-based company, BioBots, has released a printer that lets users 3D print human tissue and (potentially) human organs and printed a replica of Van Gogh’s ear. Further, the report states that the major challenge is viable three-dimensional tissue requires an efficient means of delivering nutrients and oxygen to its innermost cells and that in the creation of tissue in the lab, vascularization remains challenging, also when building layer upon layer of cells to create 3D tissue constructs, structural integrity within the bioprinted sample is another challenging problem. Based on geography, North America is leading the bioprinters market with 48% of global 3D bioprinters market share, followed by Europe owing to rising demand for organ transplantation, growing R&D, increasing public and private investments in research and rising use of 3D bioprinting in drug discovery are driving the growth of this market. APAC is the fastest growing 3D Bioprinter market and tends to be the highest revenue generating market. Regions such as Japan, Russia, UK and China are set to showcase explosive growth, with a CAGR of almost 31% through 2024 due to increasing stem cell research and rising number of startups. 3D bio printers are being used in regeneration of organs and tissues to carry out the research of various drugs and processes in pharmaceutical industry, cosmetics industries and in healthcare sector providing growth opportunities to the 3D Bio Printing Market. What is the total market size by 2024 and what would be the expected growth rate of air data system? What is the revenue of 3D Bioprinting in 2015-16 and what would be the expected demand over the forecast period? 8.2.2. Nano 3D Biosciences, Inc.
8.2.5. Regenovo Biotechnology Co., Ltd.